Stronger enemies do not need to be automatically bigger than you. That is just lazy and bad design. And in the case of warhammer you do not need to invent it - look at original models, follow the size. Set this current order state as My default. What do you mean by twice the size? You are a regular human, not a deathwatch SM, so they should be definitely bigger than you are. I don't think CSM are that big for it to be an issue. Forget they are bigger than you, they tower above most enemies and just looks plain weird. Also the crusaders look anything but ordinary - quite bigger than normal humans, wearing power armor (with missile launchers) and using heavy weapons. too ad some clarify space marines are not human as such, whereas inquisitors are, while they have power armor it's adapted similar to the sororitas power armour and regular human size. Thus far I think it's pretty correct size wise in terms of being consistent with the lore/books etc. Haven't had the same gripes with it in terms of visuals myself. I do think some adjustment is needed as something about the models just looks off. 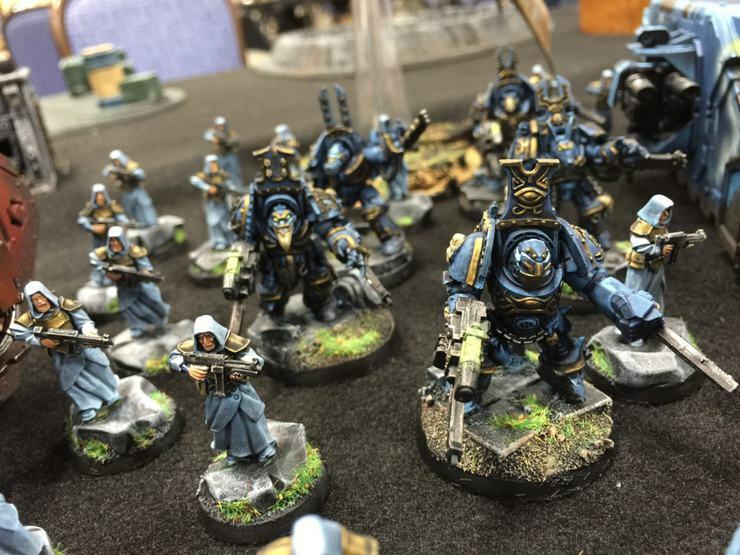 However them being astartes and you being human they should dwarf you a bit as others have said. Space marines are genetically engineered super soldiers. They're actually that big in the lore. I agree with the size of the SM model. It should be bigger than you and towering over the cultist and normal enemies. Still I think your model is a bit dwarfed. You are the same size as a human cultist, wearing nothing but robes compared to your power armor. I will like to see a minor adjustment of maybe 10% in your size to feel totally confortable with relative sizes. It is nothing game breaking even though a bit bad for immersion. *Edit for clarification, or at least tried to. Thanks for the feedback guys, indeed, there is some useful stuff in here to take into consideration. I will mention this to the developers and add it to our feedback section. Feel I should clarify. I do not mean they should not be bigger than you. I very well realise Inquisitors are not genetically engineered, or at least not like a marine is. Still the crusader should be taller, you are about 15inch shorter than the shop lady and it is weird. 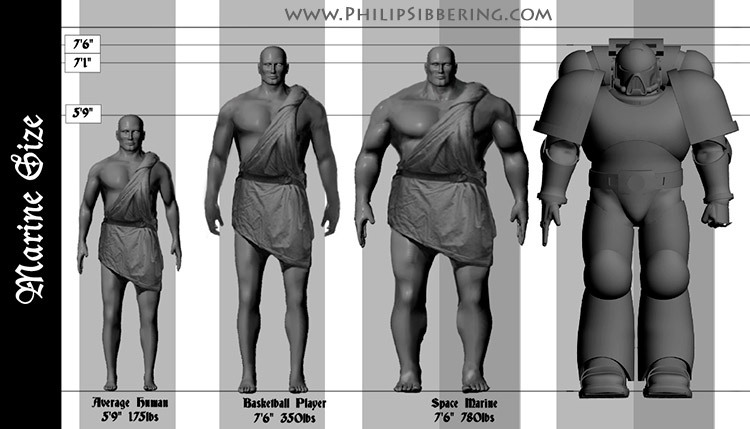 Lore says space marines are between 7-8 ft allowing for some variation, but sorcerers especially look like 10ft. No Idea why sorcerers would be bigger than the other Space marines, GW models definitely aren't. The weapons also look scaled with the model. They do not need drastic size reduction, but at the current stage they look bigger than GW models comparatively, and sorcerers are not bigger than other marines, so their size should be equalised. A bolter is a bolter, and it should be the same size as your weapon. This is a chaos sorcerer next to cultists - all models are not standing straight up, but as you can see the sorcerer is about one "head" taller than the cultist. Quite more massive otherwise, but not so much taller. That is a terminator next to a cultist. You can clearly see that while They are quite massive, they are not 10ft tall. And if you look at where the helmet is that is the size of the marine inside it. Again - about a space marine head taller than a cultist. 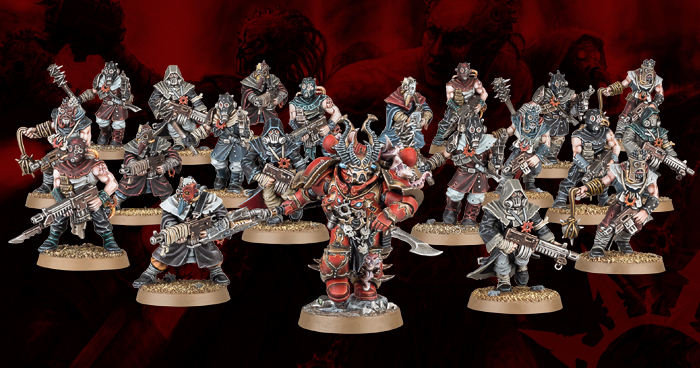 On this one you can see that the chaos marines are not that taller even than the fat guy up front, despite almost everyone being a character in this specific picture. You can also see the bloodletter deamon being almost as tall as a space marine, although much less bulky. ***Sorry had to reduce the size otherwise it breaks the forum page.